Editing the point cloud allows to clean the 3D model by reducing noise and improving the precision as well as the visual rendering. This impacts the outputs of step 3 like the DSM and orthomosaic. Access: Available once step 2. Point Cloud and Mesh has been completed. 1. On menu bar, click View > rayCloud. 2. 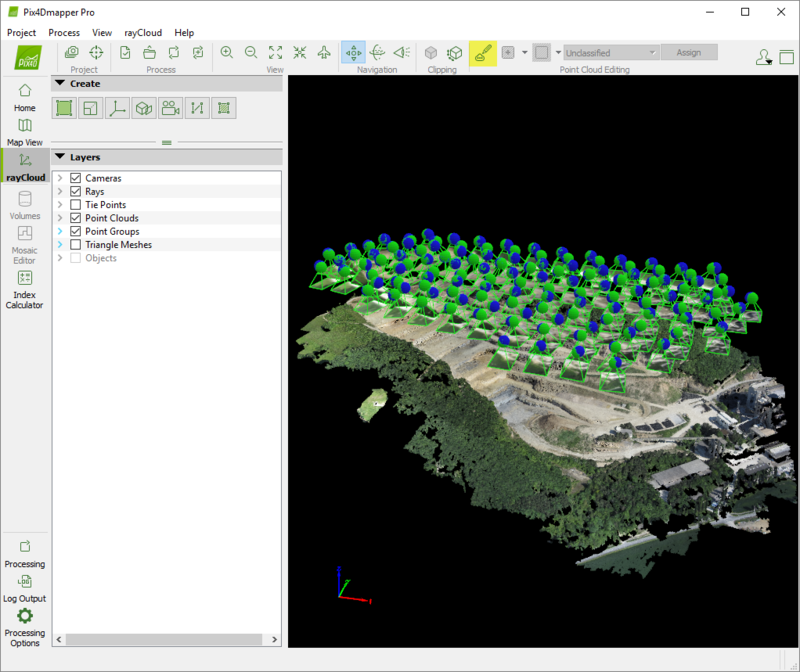 If the densified point cloud is not loaded or displayed in the 3D view: In the section Layers on the left sidebar, select Point Clouds. 3. (optional) Visualize / hide the groups of the points to be edited: In the section Layers of the left sidebar, select / unselect the desired Point Groups. Note: By default, all the points are Unclassified. When the point cloud classification has been performed, all the points are assigned in one of the predefined point groups. 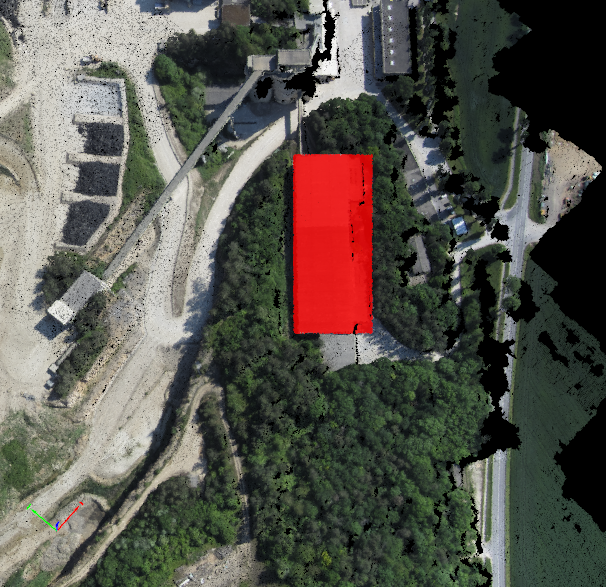 For more information: How to generate the point cloud classification. 4. 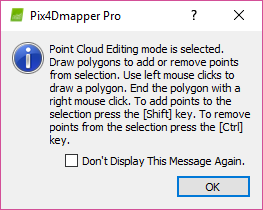 In the toolbar, click Edit Densified Point Cloud in order to activate the editing mode. 5. The following pop-up message appears. Read it and click OK.
6. By default Add Points to Selection is selected. To select points, draw a polygon in the 3D View by using left mouse clicks. End the selection with a right-click. A red polygon highlighting the selected points is visible in the 3D View. 7. (optional) To remove points from the selection: In the toolbar, click the arrow beside Add points to selection and select Remove Points from Selection. In the 3D View, on an area highlighted in red, left-click to draw a polygon around the points that have to be removed from the selection. End the polygon with a right-click. The selected area is not highlighted in red color. 8. (optional) To clear the current selection: In the toolbar, click the arrow beside Select All and select Clear Selection. 9. (optional) To invert the selection (i.e to convert all the non-selected areas to selected areas and vice versa): In the toolbar, click the arrow beside Select All and click Invert Selection. 10. Once the points are selected: In the toolbar, click the arrow beside Unclassified and select the group to which the selected points will be assigned. In order to assign the points to a new group, click New Point Group. A pop-up appears, type the new point group name and click OK. The new group created is selected. When processing step 3. DSM, Orthomosaic and Index, the points belonging to the group Disabled are not used. If the DSM is generated before assigning points of the point cloud to the disabled point group, step 3. DSM, Orthomosaic and Index needs to be computed again to compute volumes based on the edited point cloud. 12. Exit the editing mode by clicking again the button Edit Densified Point Cloud in the toolbar. 13. In the menu bar, click Project > Save Project. 14. Export the new densified point cloud that was just edited. 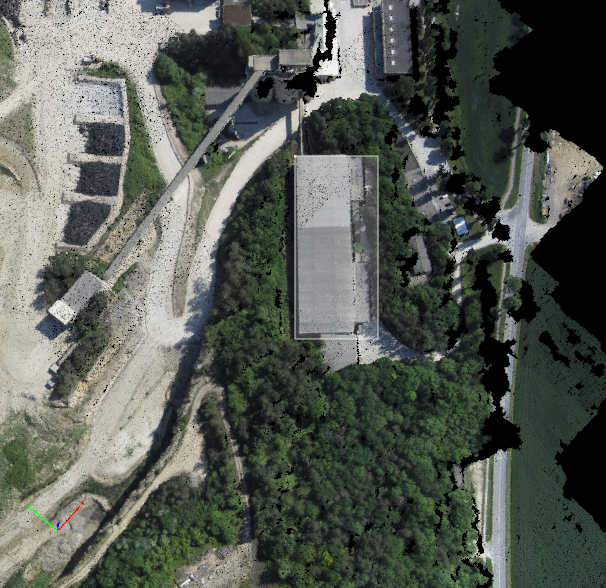 For more information: How to export the Point Cloud. Hello. Thank you very much for your time. I have the following issue: I already processed 1; Initial Processing and 2; Point Cloud and Mesh, I already generated and loaded the point cloud, but the "Edit Densified Point Cloud" Tool is not accesible, I am not able to click on it and activate it. What could be that Im not doing, or doing wrong? It might be because you were working on some other feature/functionality (drawing a polyline for example) that impede you to use the Edit Densified Point Cloud function. Try to press "Esc" to exit your current activity this should enable the Edit Densified Point Cloud tool. If it does not work, could you please provide a screenshot of your issue? Hello! Is there any way to "undo" an edit in the raycloud if I already assign the points to "disabled" ? Hi Pedro. There is no undo for pointcloud edits. You can reclassify the points back to the desired group to undo any unintended changes. Have you followed Marco´s suggestion of clicking the "Esc" button to exit your current activity? This should enable the Edit Densified Point Cloud tool. Es posible que desee considerar el uso de la herramienta Carve para automatizar parte de la eliminación de puntos. Vea el artículo en el siguiente enlace. De lo contrario, puede abrir una solicitud de soporte para obtener consejos específicos. You may want to consider using the carve tool to help automate some of the point removal. See the article at the link below. Otherwise you can open a support request to get specific advice. can I see the changes in my mesh visualisation after editing point cloud?if yes, I have problem with that. although I classified a group of my point cloud to not be considered it is still considered in my texture mesh even when I chose to generate a new texture mesh!! I have photos of a tall frame structure, like a warehouse without roof or walls. The algorithm is really bad for classifying this. And I would like to know what is the best approach to reclassify the points. The highlighted beam is surrounded with points colored like the object that should be on a lower level. Part of these points are classified as building, and other parts of the beams are classified as vegetation. How should I reclassify the points? By texture color? If I reclassify the orange points there with ground, they will go down in the DSM? Or should I classify everything by elevation? How to improve this model? The points around the beam are likely noise which would mean that you want to remove them by assigning them to the "disabled" category. You can also try removing these sorts of point using image annotation. This won't work in all situations but is a tool you should be aware of. Another way to reduce this sort of issue is to have high image overlap and a slightly oblique angle when acquiring the image data. Then when processing step 2 increase the minimum number of matches to 4 or 5. This will reduce the overall number of points in the dense point cloud but will also reduce noise like this. I have the same problem. But i think it is impossible to edit the point cloud for the mesh visualisation, because both are getting created at the same step. Maybe a Pix4D member can give us an answer. I thought the same but I saw on a trainig video on YouTube on pix4d channel he simply edited that and by reconstructing the mesh , bobbles and noises were gone! I followed exact the same steps but couldn't see the result at all!! Hi all. The dense pointcloud and mesh are both generated during step 2 but you can regenerate the mesh after step 2 by following the instruction below. The basic workflow I usually follow is to disable mesh generation for step 2 and only create the pointcloud. Then after step 2 is complete you can make edits to the pointcloud by disabling points, annotating images, or drawing a processing area. Then set your desired mesh settings in the processing options and generate only the mesh using the instructions in the article above. The mesh should then reflect the changes you made to the pointcloud. El proceso para clasificar árboles sería el mismo que se indicó arriba. Para regenerar las líneas de curva después de haber editado la nube de puntos, primero debe regenerar el DSM o DTM ejecutando el paso 3 o usando el menu y luego generar las líneas de curva. Vea los paginas abajo para más información.